Residents in New York City's one million rent-stabilized apartments complained bitterly about the rent increases that the Rent Guidelines Board voted for last June. "I can't afford this increase," said Cita Karan, an adjunct professor at CUNY who earns less than $25,000 a year and pays $1,200 a month rent. "Students I teach quit school because they can't afford housing." It may be the most famous fact about the city that many New Yorkers struggle to pay rent and find affordable housing. But instead of placing all blame on the Rent Guidelines Board, renters would be well advised to look at a payment most do not even realize they make, one that is certainly larger than the latest rent increase-- their property tax. Yes, renters are paying property taxes. And the burden on renters is disproportionately high compared to what is paid by owners of condos, co-ops and especially houses. Out of the rent Cita Karan pays each month, $132 of that is estimated to go to property taxes. By contrast, someone who owns a house worth the same amount as Karan's apartment would pay an estimated $30 in taxes. Not only is this inequality dazzling, but it is very close to a complete secret. Renters might complain, if they knew about it. But nobody -- neither landlord, tax officials, nor elected officials -- tells them about the substantial share they must pay of their building's property taxes. To its many supporters, including almost all elected officials, the city's property tax system is just fine, helping to promote home ownership, and providing, as it always has, the single largest source of revenue for the city government. Critics, on the other hand, charge that the system is unnecessarily complex, inequitable, and inefficient. For renters, who represent two-thirds of all New Yorkers, the property tax is simply a mystery. How did we get such a difference in tax burdens? State and city officials responsible for property tax laws have consistently catered to owners rather than renters. But renters in New York City, in spite of their numbers and clear economic interest, have never really raised a fuss. The city's property tax law is incredibly complicated. Most renters fail even to see themselves as property taxpayers since the building's owners pay the tax directly, and then of course pass the cost onto their tenants in the rent. Estimates vary, but in 1993, economist Howard Chernick estimated 75 percent of the cost is passed on to the renter. The last comprehensive study of the city's property taxes was done in 1993, a joint project of the City Council and then-Mayor David Dinkins. It found the system "inordinately complex ... poorly understood by taxpayers," and marked by a wide disparity in tax burdens. In the early days of New Amsterdam, Peter Stuyvesant's government made money by taxing liquor. It was only when the city went into debt that it tried to raise the money with a property tax. But angry citizens rose up and stopped the tax. The city developed the first comprehensive system for assessing and collecting property taxes in 1859, and as late as the 1950's, property taxes still accounted for 70 percent of the city's revenue. But other taxes have been added one by one -- the first sales tax was instituted in 1934, local income tax in 1966 -- and now property taxes provide just about a third of the city's revenue, though that still represents the largest single source of funds. 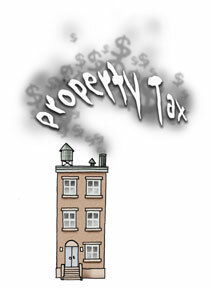 The system of property taxes as we know it comes from a 1981 state law. The law was supposed to make the property tax system more rational and equitable. The political intent, however, was to protect homeowners. Class 1: one-family to three-family houses. Class 2: all other residential properties, broken further into three subgroups; coops, condos, and rentals. Class 4: all other properties, including commercial property and vacant land. Under our current system, Class 1 buildings have the best property tax deal. Class 2 coops and condos have good deals, but not as good as the owners of houses. Class 2 rentals, and Class 4 commercial properties get the largest share of the tax burden. For city house owners, the estimated tax rate averaged 0.55 percent, according to the Independent Budget Office. That means the annual taxes on a $300,000 house in New York City would average $1,650. This is less than a thir d of the average tax rates in surrounding areas: Long Island, for example, had an effective rate of 1.90 percent, or, for a house again costing $300,000, average taxes of $5,700. The argument of elected officials who support the current property tax structure is that unlike any other city, New York City has over 20 other taxes. Other residents in the state, for example, pay no local income tax. So, as a study by the Independent Budget Office showed, if we add the local personal income tax burden to the property tax burden, then the average New York City homeowner actually winds up paying slightly more than the average homeowner in the rest of the state. But if the system was designed in part to fix inequities between homeowners in New York City and homeowners in the rest of the state, the inequities between New York City homeowners and New York City renters were ignored. The poorer New Yorkers wind up paying the most tax. The average New York renter earns $33,000 a year, compared to an average of $60,000 for house owners and $177,000 for coop/condo owners, according to the Independent Budget Office. One simple alternative to the present system would have been to treat all property the same, assessing them all at market value. Then, depending on how much the city wanted to spend any year, it could determine one property tax rate for all owners. Another simple alternative would have been to have two classes -- residential and commercial. In 1996, the City Council gave a tax break to coop and condo owners, trying to lower the imbalance between coop and condo owners and house owners. It has not worked exactly the way they planned. The Independent Budget Office has shown that now, some coop and condo owners in the city's most expensive neighborhoods, like 5th Ave. and Central Park West, actually have a lower tax rate than house owners. And coop and condo owners in different boroughs now pay different amounts. Coop and condo owners in the Bronx and Queens have much higher rates (1.99 and 1.63 percent respectively) than those in Manhattan (0.95 percent). The City Council's efforts were certainly well intentioned, and not useless. It did help move coop and condo tax rates closer to the rates of house owners. But the rates are still uneven, and no one is talking about changing the tax rates for the renters. There is only one property tax issue on the political table today -- to further lower the property tax burden on coop and condo owners to equal the level currently enjoyed by house owners. But meanwhile legislators are silent on the other issues. No one questions why property tax revenues have actually declined between 1993 and 2000, while the city has had one of the biggest real estate deals in history. Property taxes -- the one major tax whose rate is under the city's control -- represented 45 percent of all city tax revenues in 1993; in 2000 it was 35 percent. Few people talk of simplifying the system, addressing the inequities within classes and across boroughs, or telling renters what they are actually paying in real estate taxes. These questions await another property tax reform commission, or a fiscal crisis, or an economic slump, or political action by tenants who finally wake up to what they are paying.